Confucianism has weathered tough times over the course of history to remain at the core of ethnic Chinese culture, promoting societal harmony and social progress. The great sage Confucius was born 2,568 years ago, and Confucian temples have recently celebrated his birthday with rites, music, dance, food and offerings. 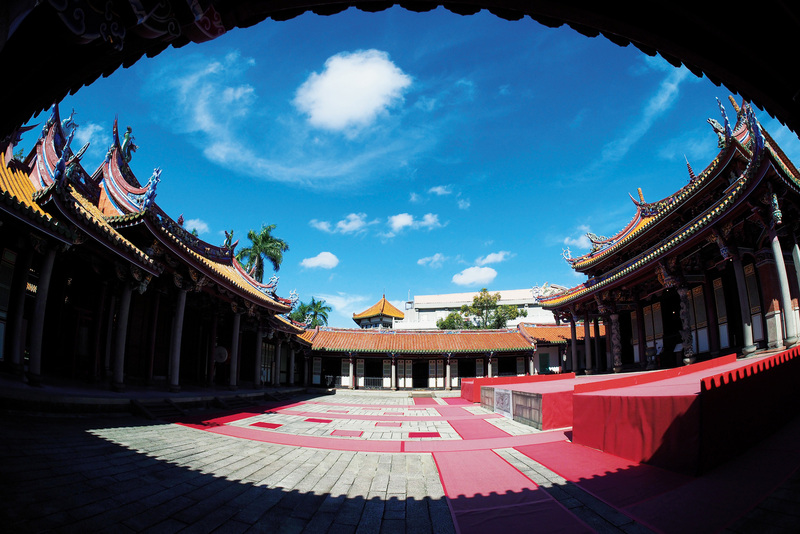 The Tai­pei Confucius Temple, which is the largest in Taiwan, pulled out all the stops, holding an “inaugural” ceremony at the site of its previous location, a “Confucius Cultural Seasons” program, and outreach activities. Planting new seedlings in fertile soil and growing new branches from its old trunk, it is thriving. 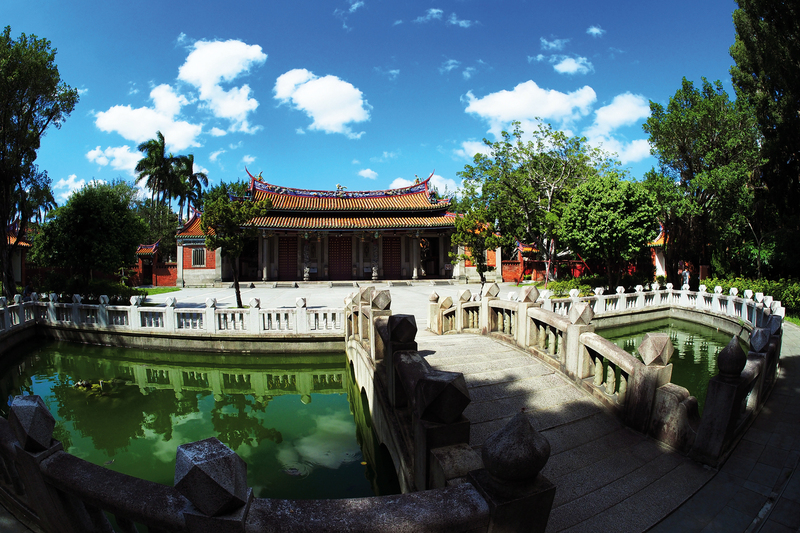 Occupying more than 1.3 hectares, the Tai­pei Confucius Temple has solemnly stood in its present location for 80 years. In 1990 it was designated as a municipal historic site. 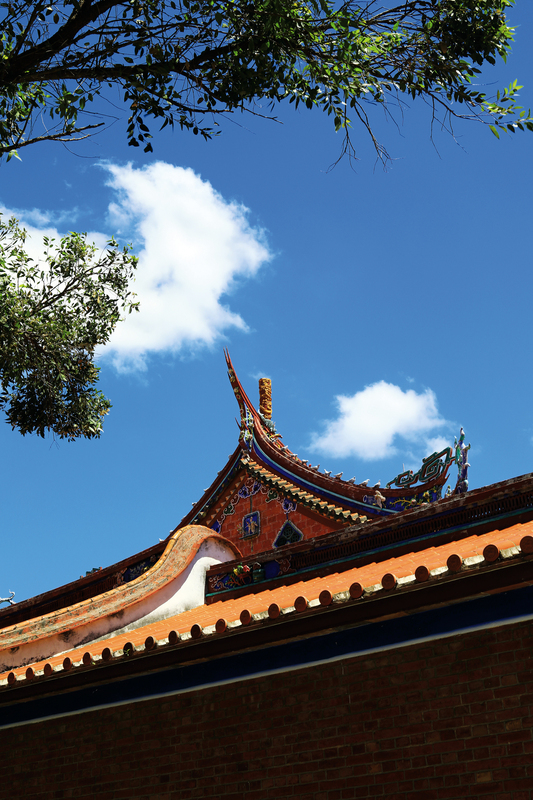 “The Southern-­Fujian-style architecture and temple atmosphere are its salient features,” says Chen ­Tsung-wei, executive secretary of the temple’s governing board. 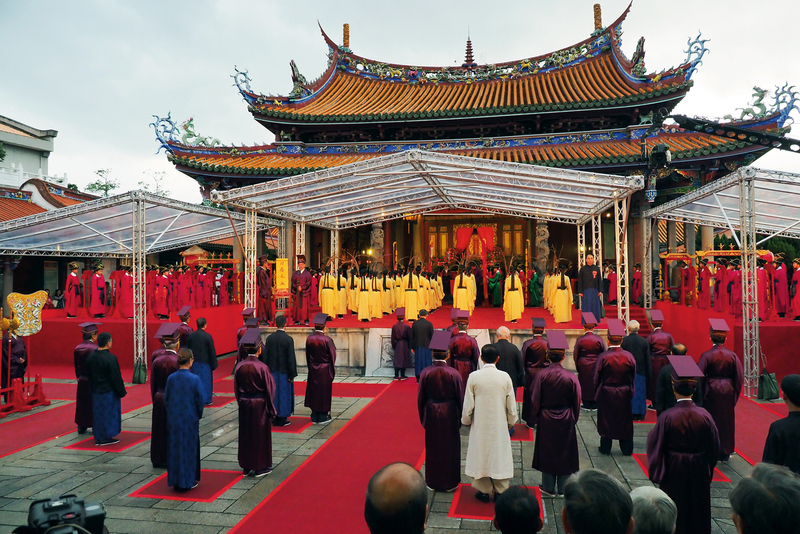 “The Autumn Confucian Ceremony is an important event at the Confucius Temple,” explains Chen. Rites, music, dance and food are all featured in the celebration at the temple, which is the most complete version of this national-level ceremony. Held every September 28 on Confucius’ birthday, it encompasses 37 different steps, including preparations, welcoming the spirit, offerings, escorting the spirit, and the finale. The solemn, magnificent rites and music provide many opportunities for education. Musicians in long red robes and Yi dancers in yellow gowns were the center of attention at the ceremony. The musicians, who had been practicing for a year, are all enrolled at Tai­pei Municipal Chong­qing Junior High School. 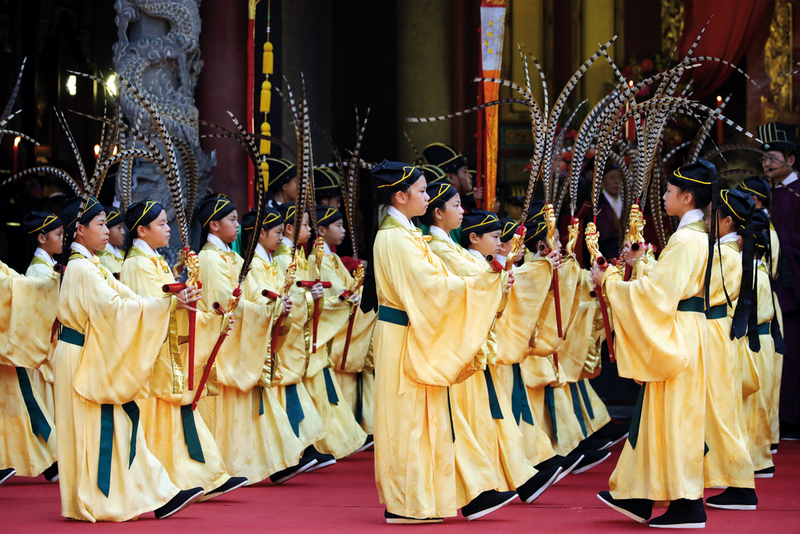 The rites and music in this ceremony date to the Song Dynasty. 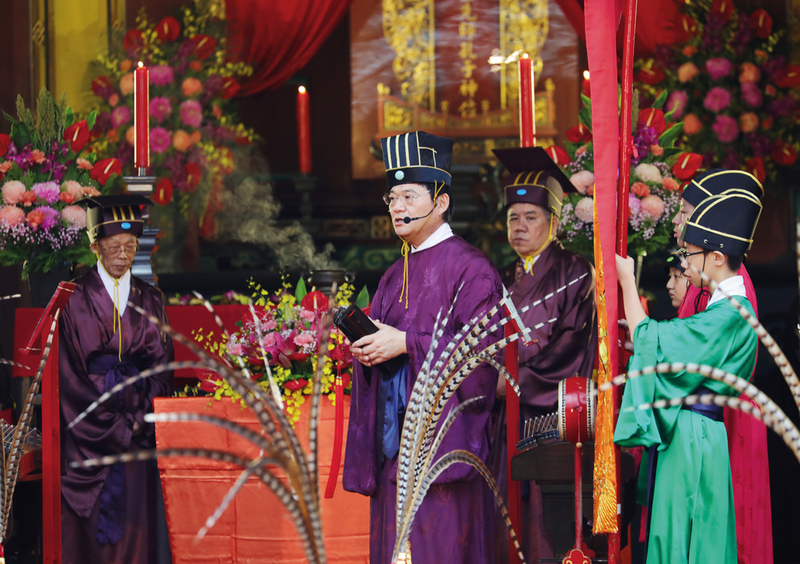 Sun Rui-jin, the leader of musicians at the cere­mony, has concerns about having no one to pass these traditions down to. “I hope that the music performed during Confucian ceremonies won’t disappear with this generation.” Although he is not a descendant of Confucius, he has taken it on his own shoulders to keep these traditions alive. “Giving children opportunities to better themselves has motivated me to devote myself to this mission without regret.” The training spans both summer and winter, and cultivates the children’s character and stamina. Sun deeply understands how the exacting preparations gradually instill a sense of duty and honor among the children. “I had one student musician who almost didn’t graduate from junior high school.” More than a decade later, Sun got a phone call from the student, who discussed his bright career situation with his former teacher. What had brought a kid that was going down the wrong path to mend his ways? “I asked him who put him back on track. He responded, ‘Confucius.’ It brought tears to my eyes.” At that moment, Confucianism wasn’t stale learning found in dusty books, but rather the highest form of wisdom anointed by life experience. Since 1931, the dancing students have all come from Tai­pei Municipal Da­long Elementary School. This tradition has not been broken for 87 years. As they move their bodies, the dancers convey a gentle elegance and sense of ebb and flow that are inherent in Confucianism. In their gaze and their steps, the dancers practice self-­cultivation through control of their bodies. The famous “Confucian cuisine” embodies the sage’s belief that “food cannot be too fine, nor meat too finely minced.” This rigorous approach to cooking epitomizes Chinese culinary arts. Food for this ceremony is prepared under the guiding principle of “culinary harmony.” Since 2007, it has been made by students from the Kai Ping Culinary School; the students and their teachers have consequently earned the moniker “Confucius’ chefs.” They prepare 189 dishes in total. “The Tai­pei Confucius Temple’s original location is where Tai­pei First Girls’ High School is currently located,” notes Li ­Chien-lang, professor at National Taiwan University of Arts. This fact was highlighted when the temple organized a “rediscovering our roots” program during its “cultural season” in 2017, 110 years after its founding. 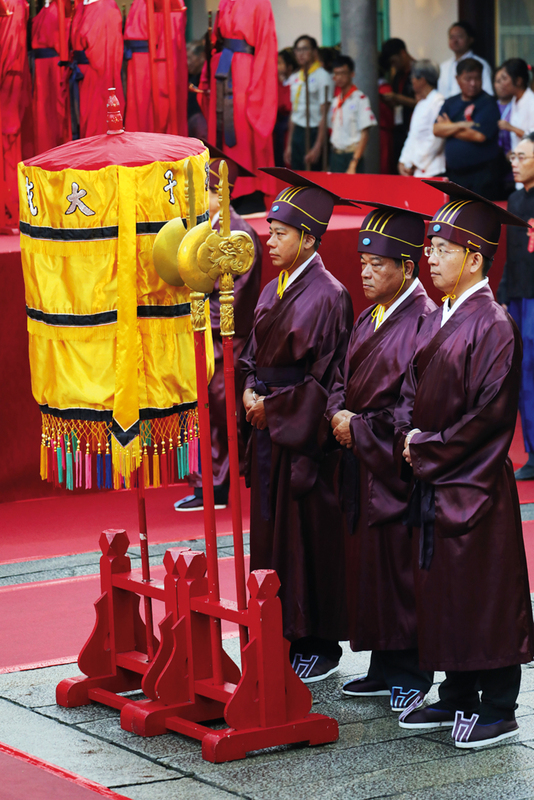 On September 21, the Chinese Association of Confucius and the “rites research team” organized by the NTU professors of Chinese Yeh Kuo-­liang and ­Huang Chi-shu led a group from the temple back to the Tai­pei First Girls’ High School campus to hold an “inaugural ceremony” there that was hosted by the school’s principal, Yang Shih-ruey. To the accompaniment of solemn ancient music, the students were each given a bamboo scroll. These gifts were aimed at instilling a sense of gratitude and inspirng a devotion to study that would lead to bright futures. This year the Confucius Temple organized a series of elegant activities for its Cultural Festival. The events kicked off on September 22 with a reading by the Tian­lai Poetry Reading Society, which was established during the Japanese colonial era and has been around for nearly a century. Under clear skies after a rain, they recited classic poetry about the fall moon. Their voices reverberated between the temple’s eastern and western gates. 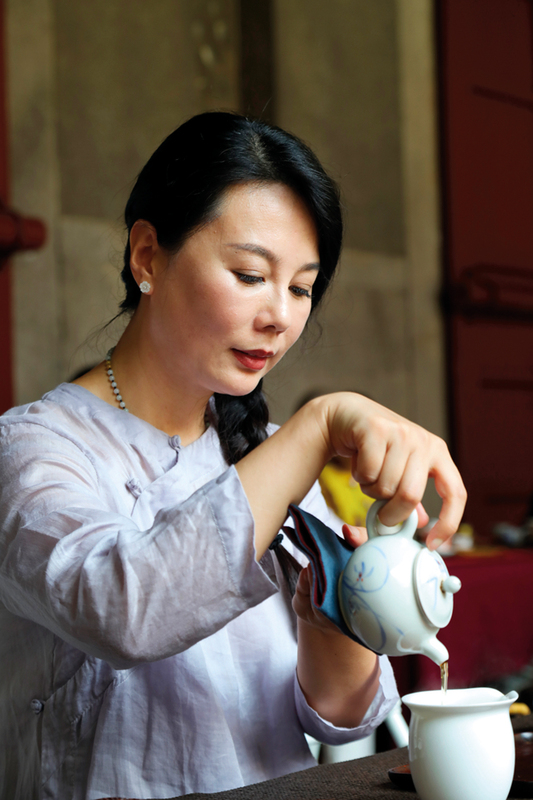 On the morning of October 23, Kong Yiru (a 73rd-generation direct descendant of Confucius), along with tea experts such as Nancy Chao, Wang ­Jinxi, and Ke Li­yue, performed a Confucian tea ceremony. In the afternoon, a musical ensemble led by the ­pianist Kung Wei-­liang and the violinist Cai Yi­xuan held a session on music appreciation. They interpreted modern musical scores using classical melodies. The name “Confucius” is a Latinized version of Kong Fuzi, “Master Kong.” Confucius’ Chinese name was Kong Qiu. Thus his descendants bear the family name Kong (also spelled “Kung”) and those in the direct line of descent have been honored with noble titles and official posts down the ages. In 1935 the ROC government replaced the title of Duke Yan­sheng with the political office of Sacrificial Official to Confucius, which is now held by Kung Tsui-­chang, the sage’s 79th-generation lineal descendant. 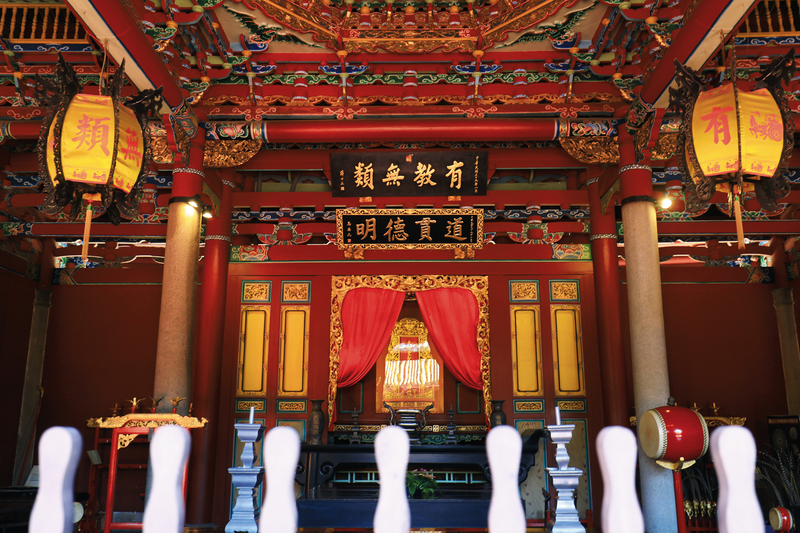 The Tai­pei Confucius Temple is both a Kong family shrine and a spiritual bastion. The family participated in the Cultural Festival for the first time this year, giving the festivities special meaning. “Our family may be the only one that can be traced back generation by generation for more than 2500 years,” says Kung Tsui-­chang. Kong Fan­lin, a 74th-generation descendant, explains: “I hope that the Confucian Cultural Festival will reawaken a sense of mission among the Kong family,” raising consciousness of family duty and sending ripples outward to inspire greater collaboration among Confucian scholars. For this year’s festival, the members of the clan became mobilized. “Although each of us individually has little power to effect change, collectively we can put a shine on the family nameplate,” says Kong Xiang­yun, a 75th-generation descendant. “Every time I see a likeness of Confucius in America, I feel moved. It encourages me to try harder. 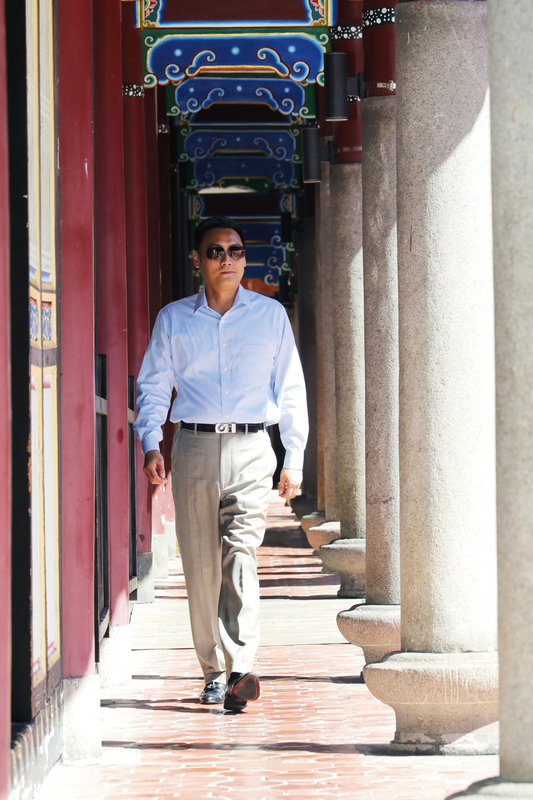 I can’t let the family lose face,” says Kung Wei-­liang. The ties of blood remain, wherever one goes. “Without Confucius, all ages would have been dark.” The Southern Song poet Zhu Xi thus exalted Confucius. Having undergone the test of time for 2568 years, Confucianism still can provide a guide to modern life. The insights of this great sage continue to earn respect. The essence of this cultural legacy is the Confucian virtue of benevolence—a love of heaven and earth and of all living beings. One must strive to realize the edict: “What you do not wish for yourself, do not do to others.” Kung Tsui-­chang notes: “The essence and meaning of the five principal virtues of Confucianism—benevolence, uprightness, propriety, knowledge and integrity—should not be used only as yardsticks for personal cultivation. Rather, they should be governing principles of nations.” Confucianism is not merely a philosophical national treasure of ethnic Chinese people. Instead, it has spread far and wide to influence all of humanity. Education in performing Confucian music and rites can serve as a navigator charting the way forward in life. After 25 centuries, Confucianism is not out of date. To the contrary, it still remains good medicine for the ills of the era. May everyone uphold the vision of Confucius in “taking responsibility for the state of the world and striving to bring peace for future generations”!